If you're not familiar with how Android updates work, here's a summary. Google releases a new Android version, which silicon manufacturers (e.g. Qualcomm, Mediatek) have to supply drivers for. Once that's done, device makers (e.g. Samsung, HTC) can start re-adding all the tweaks they have made to the new Android source code. In the case of carrier-sold phones/tablets, device makers then have to wait for the carriers to approve the update. After all that is done, users finally start to receive the update. Google is hoping to speed up this process with Project Treble, which changes the architecture of Android. Essentially, a new 'Vendor interface' will contain all of the low-level software for a device - like the chipset drivers. 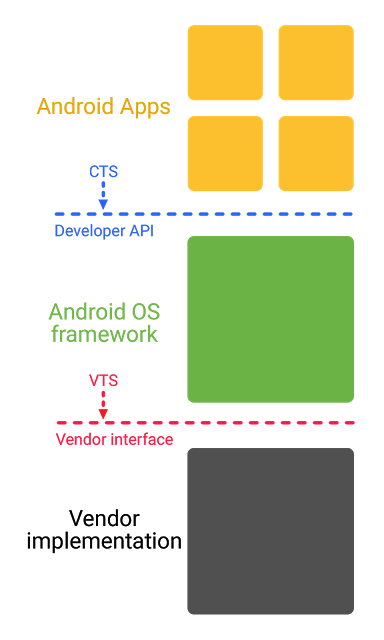 Google will work with chipset manufacturers to make sure the Vendor interface is forwards-compatible, and the interface will be validated by a Vendor Test Suite (VTS). The aspect of this news I'm most excited about is that the Vendor interface is forwards-compatible. There have been many cases where chipset manufacturers have not updated drivers for specific popular chips, preventing devices using them from being officially updated to newer Android versions. One example is the Nexus 5 and other Snapdragon 800/801-based devices, which were never officially updated to 7.0 Nougat. It sounds like the Vendor interface will prevent this from happening, or at least prolong the end of support for a given chip. Google says that Android O will be the first version to use the new Vendor interface, and the Android O Developer Preview already has it. Hopefully we'll hear more about Project Treble at Google I/O next week.